Hi all, my first time posting here - please let me know if I haven't given enough info! 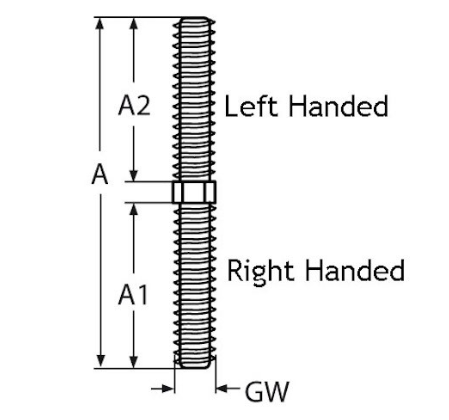 I would please like a quote for two left and right threaded connecting rod with the following dimensions made from stainless steel (see image linked below). No huge time limit on this request, just as soon as is convenient. Again my first request on these forums so if I've forgotten anything obvious just let me know! Go to a local machine shop in the UK and get these TWO parts made. There are many UK based members here. Maybe you should be more specific on your location. Also explain the application, possibly a crude fix would work like tacking a couple off the shelf bolts together. Might inquire with these folks. The size and quantity you are searching for is right in line with what the members of Model Engineer could provide. Possible part stock source but not having long enough thread and not having the hex at center. Good find. What I want to know is how someone in California can survive selling two of those for $7.90 including shipping, even if they got them for free. likely drop ships from China ..so all he does is resend the purchase order and we pay the shipping through our income tax paid. so the seller in China or perhaps India ships E-ship for near free on his side..Likely cost $6.00 or more for us to ship the other way. Just another form of giving away American jobs..because we are stupid.. Go figure. So the OP want's them cheaper yet ? Even if it drop ships from China, how much would the USA based person make? Also how many transactions could you do an hour? I used to live near the listed location a 1 bedroom apartment in a bad neighborhood is $1200. People do all sots on small devices to make .05 to a quarter .. look at YouTube where the watch half an add gives a tiny profit.. Thank you so, so much this is perfect! Thank you as well to everyone who chipped in to help with my request I truly do appreciate it, what a helpful forum. The part is to fix a drafting machine on an old technical drawing table that my dad found in an old garage, bit of a pet project we've been working on that I had no real idea about. Thanks again everyone, can consider this thread closed now. If the central area has sufficient diameter a thread-die or single point threading might make threads long enough, then some means of adding the hex might be considered. It (the hex) might just be screwed onto the part (rod) and some locking Loctite added to fix it in place. The Hex might be a standard nut, or hex stock drilled and tapped. It is "based" in the US - sure, but there are several regular members here from the UK and surrounding areas. There is no reason at all for you not to post your RFQ here.